Dried red pepper may be used whole or powdered. India is the largest producer of red chillies. As the name suggests it is red in color and can be consumed as it is or can be broken down and made into a powder. It is really spicy and the intense heat is concentrated in the seeds. Fresh red chillies are milder. Red chili’s are usually grounded into a powder and used as a spice. Red chili’s are dried or pickled in order to store them for a long period of time. It is a popular ingredient in most Indian dishes and curries. Red chili’s are also used extensively for making sauces which are used to add spice to other dishes. 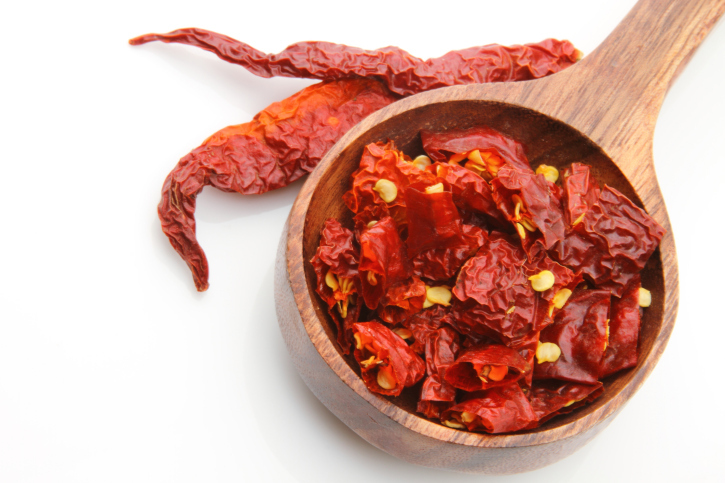 They are an excellent source of vitamin C but excess use of red chillies may cause indigestion and heartburn. Capsaisin, the chemical that makes chillies hot is known to reduce the risk of skin and stomach cancer. They contain more vitamin C than an orange. It also acts as a remedy for cold and sinus symptoms. It does not contain any cholesterol. Red chili’s or red chili powder must be kept away from eyes, if comes in contact, it can even cause permanent damage and in some cases, even blindness. Chili’s should not be consumed separately. The seeds of chili’s cause innumerable cuts on the tip of our tongue, it is these cuts which cause that burning sensation in the mouth. The best relief from the burning sensation of chillies is drink milk or have a spoonful of yogurt. Drinking water only enhances the burning sensation! “Scoville heat units” [SHU] is the measuring unit which measures the hotness of chili’s. A sweet bell pepper scores 0 on the Scoville scale, a jalapeno pepper scores around 2500-4000 units, and a Mexican chili called HABANEROS scores 200,000 to 500,000 units. The Bhut Jolokia is the spiciest red chilli in world. It is grown in Assam and Nagaland. A Chili is a fruit. It is legally a vegetable in the US but botanically it is a fruit.